A new U.S. Forces Korea commander took office on Thursday, vowing to further strengthen the long-standing bilateral alliance and deter any provocations on the Korean Peninsula. Gen. James D. Thurman, who replaced Gen. Walter Sharp, will also serve as the heads of the United Nations Command and the Republic of Korea-U.S. Combined Forces Command. 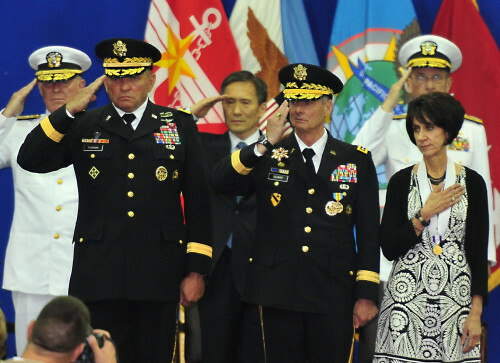 During the change of command ceremony held in the Yongsan Garrison in Seoul, Thurman stressed the importance of the alliance forged during the 1950-53 Korean War. “Both nations are prepared to honor our commitments, provide stability, deter conflicts if we must fight and win. This alliance stands ready to counter any provocation intended to destabilize the Korean Peninsula. With your help, I promise to do all I can to continue to strengthen this great alliance,” he said. Inter-Korean tensions remain high in the wake of the sinking of the corvette Cheonan and the shelling of Yeonpyeong Island last year. The two attacks killed 50 South Koreans including two civilians. He is also facing a crucial task concerning the U.S. transfer of wartime operational command to Seoul, scheduled to take place in December 2015. The ceremony was attended by top South Korean and U.S. officials including Defense Minister Kim Kwan-jin, Chairman of the Joint Chiefs of Staff Adm. Mike Mullen, Pacific Command Commander Admiral Robert F. Willard and U.S. Ambassador to Seoul Kathleen Stephens. Gen. Sharp, who had served here since taking the USFK helm in June 2008, expressed his wish that North Korea would change its policies and come forward to the international community as its responsible member. “If that day would ever come, I am confident that this alliance would be ready to help the people of North Korea. But until that day comes, this great alliance will continue to adjust and grow even stronger, ready to face any threats,” he said. Praising Sharp’s dedication to ensuring security here and enhancing the alliance, Defense Minister Kim expressed confidence that the new USFK commander would also carry out his mission here successfully. “Under the leadership of Gen. Thurman, the CFC will ensure that it would deter a war or win in the event of an emergency here,” he said. Meanwhile, Adm. Mullen stressed a “multinational” approach to deal with regional security issues, particularly those on the “unpredictable” North Korea. “The threat remains very real. North Korea shows no signs of relenting in pursuit of its nuclear capabilities, and I am not convinced they won’t provoke again ... The only thing that is predictable about North Korea is their unpredictability,” he said in a meeting of reporters held later in the day. Mullen came here after his trip to China in which he sought to better understand the rising Asian power. “One of the most important reasons that I went to China is to try to understand their strategies and what they are doing better, and certainly continue to express both concerns about some of their highly technical developments such as the anti-cruise, anti-carrier missiles specifically, and at the same time, look at or reaffirm the U.S. commitment to the region,” he said. The new U.S. commander earned his commission through the Reserved Officers’ Training Corps at East Central Oklahoma University in 1975. He has extensive operational combat experience in a variety of conflict-ridden regions including Kosovo and Iraq. The U.S. has 28,500 troops stationed here primarily as a deterrent against North Korea.